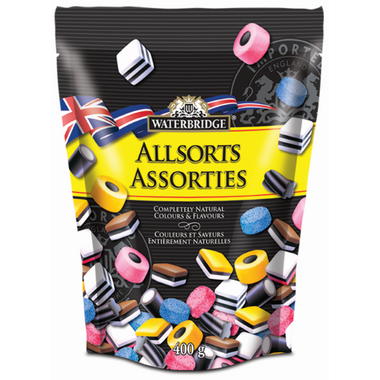 Traditional Liquorice Allsorts are all about variety: jelly buttons, solid liquorice twists, fruit sandwiches with vanilla, coconut rolls and liquorice rolls soft candy centres. All natural colours and flavours. Made traditionally to be enjoyed today. Ingredients: Sugar, Molasses, Enriched Wheat Flour, Glucose Syrup (Wheat). Desiccated Coconut (Contains Sulphites), Palm Oil, Gelatine, Cornflour, Glycerol, Natural Colours, Cocoa Powder, Liquorice Extract, Beeswax, Flavours, Fruit & Vegetable Juices for Colour. Contains Gluten. Although I don't like licorice, I love these (on the other hand, my partner--who loves licorice--doesn't like these). If you're not usually a licorice fan, these might be the candies for you (give the jelly buttons to people who like a strong licorice flavour). They're also surprisingly pretty. These are my favourite... but werenâ€™t very fresh , they were hard and not very soft. These are the best allsort. Love them! Tasty and good. Can really taste the Liquorice. These bring back childhood memories. They are delicious when they are fresh,which seems only half the time. However, when they are a bit dried out it takes longer to chew them which might be a plus. Excellent when fresh. It seems hit and miss as to the freshness of the candy. Usually I really like these but I'm finding this lot quite sweet. My Mum likes them fine so at least they get eaten!